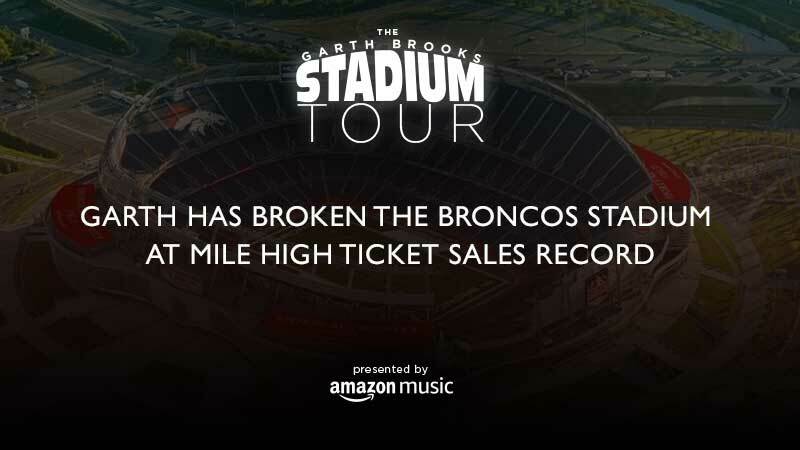 LOS ANGELES- April 5th, 2019- Garth Brooks has broken the Broncos Stadium at Mile High ticket sales record. The previous record was set in May 2011 with 77,00 tickets sold by U2. Today Garth has broken that record with 79,000 tickets sold, and tickets are still selling! The concert will be Saturday, June 8th, 2019. It will be in-the-round staging. There will be an eight-ticket limit per purchase. Tickets can only be purchased at ticketmaster.com/garthbrooks or either Ticketmaster Express 1-866-448-7849 or 1-800-745-3000. Tickets will cost $83.70 plus a $4.00 facility fee and a $7.25 service charge for a total of $94.95.